For young students, there’s no forbidden door more enthralling than the one labeled “Teacher’s Lounge—Staff Only.” What’s going on in there? Wild parties? The truth is much more mundane than the fabrications of a nine-year-old’s mind. They’re likely to find teachers doing the same thing in their downtime that most working adults do: perusing Facebook, Instagram, and Twitter. Teachers are humans, too. They catch up on social media just like the rest of us. So for companies that want to speak to educators, there’s no better place than social. 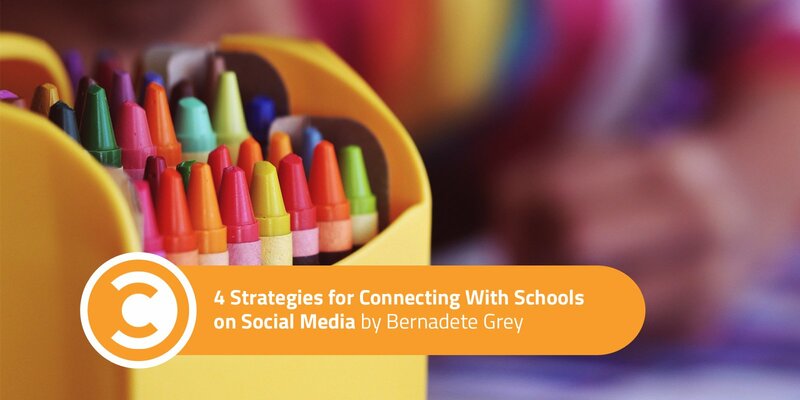 In many ways, social media is the perfect marketing medium for reaching educators. When the creative well runs dry, teachers search for inspiration online for new lessons. If they’re looking for fun, engaging classroom design ideas, they check out colleagues’ Pinterest boards. In Facebook and LinkedIn groups, they trade tips and tricks gleaned from their own experiences. Brands on social media typically find teachers to be a receptive audience. In a recent MDR study, about a third of teachers said that they trust social media for product information, and about two-thirds have become fans, friends, or followers of a company’s social media accounts. Teachers are always hunting for ways to improve the learning environment in their classrooms. If they discover a product that can help, they’ll invest in it. According to our study, teachers spend about $480 of their own money on school supplies each year. Most teachers buy classroom items online—in fact, 80 percent have made purchases on the internet. But teachers don’t just hop online and click that “Check Out” button. Teachers are all about learning, and they use the internet for that, too. 75 percent of them head to the internet first when they’re looking for information about a product. Even if your company isn’t selling glue or colored pencils, getting in teachers’ good books can still make a difference. Teachers are influencers. When they love your antibacterial wipes, they’ll recommend your brand to parents. If teachers are fans of your young adult novels, they’ll share them with students. And if they like your technology, they’ll say so to administrators. If your company is ready to boost its signal on social media to reach teachers, here are a few marketing strategies to get started. Teachers love fun, interesting lessons as much as students do. But after being bombarded with questions and suffering from decision overload all day, teachers have little energy left to create engaging activities. A how-to video that clearly and succinctly describes a great classroom activity is like gold to teachers. Think about those short recipe videos you see all over social media. Use a similar style in your videos: snappy, 30–60 seconds, cute, clear, and well-produced. A fun, helpful video will spread like wildfire among teachers on social media. If your company isn’t particularly education-focused, WeAreTeachers can help. PepsiCo recently worked with WeAreTeachers to produce a video about recycling a plastic bottle into a trophy. The video gave teachers a new craft project, and Pepsi and its recycling initiative got some exposure. It’s a win-win. Teachers love free stuff as much as anybody else. If they can get something at no or reduced cost for their classrooms, they’ll jump at it. In addition to hosting how-to videos, WeAreTeachers promotes giveaways for clients who want to reach teachers. These campaigns often bring in 5,000-10,000 teacher sign-ups each. Sweepstakes can put your company in front of thousands of teachers and get your products into schools where even more people will see them. Sanford Health’s fit4Schools partners with MDR for a fitCommit Sweepstakes. Sanford holds sweepstakes for teachers who commit to doing one healthy thing for their classes. Winners get all kinds of fun prizes for both the gym and the classroom. Teachers and parents often turn to social media for inspiration around teachable moments. So if your company has a connection to a news story, holiday, or upcoming event that might be relevant to teachers or students, talk it up on social media. For example, October is Fire Safety Month. To get the word out to teachers and their students, the National Fire Protection Agency produced an entertaining classroom video aimed at students about the history of firefighting. Through this video, as well as fire safety games, a teacher website, and more, the NFPA spreads awareness about its organization and the important issue of fire safety. Teachers, for their part, get timely, safety-focused content to teach in their classrooms. Many companies also reach out to schools, students, and teachers with competitions. One example is Samsung’s annual “Solve for Tomorrow” competition, which challenges middle and high school students to use STEAM (science, technology, engineering, art, and math) concepts to improve their communities. Samsung promotes this event to teachers on the WeAreTeachers Facebook Page. Teachers love events like “Solve for Tomorrow” because they combine hands-on learning and healthy competition. Students and schools can win prizes, while their communities benefit from student-led initiatives. Behind that teacher’s lounge door, you may sometimes find cake and balloons. But most of the time, you’ll see a group of people committed to their job discussing ways to improve their schools, their students, their communities, and themselves. Companies may not have a physical seat in that “social network.” In online versions, however, they’ll find that teachers are more than willing to connect. Bernadette Grey is the chief marketing strategist at MDR, the nation’s leading education marketing group. Prior to joining MDR, Bernadette was an editorial director at Scholastic. A New York City native and mother of two software engineers, Bernadette spends her spare time in the mountains of Vermont, where she owns a home.